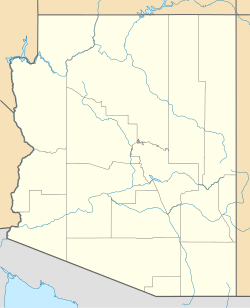 Sanders (Navajo: Łichííʼ Deezʼáhí) is an unincorporated community and census-designated place (CDP) in Apache County, Arizona, United States. 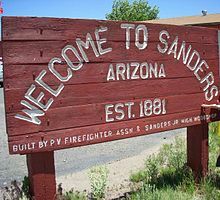 Sanders is located at the junction of U.S. Route 191 and Interstate 40. As of the 2010 census, it had a population of 630. Sanders has the ZIP code 86512. Sanders' English name either comes from C.W. Sanders, a railroad office engineer, or Art Saunders, who had a trading post nearby. The railroad station was named Cheto to avoid confusion with another station named Sanders already on the line. Sanders is located near Interstate 40 and the BNSF Railway. Old Route 66 ran near the town and some sections of the highway still exist. Sanders is surrounded by the Nahata Dziil and (north of the town) Houck chapters of the Navajo Nation. 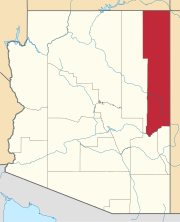 The latter is made up of local Navajos of the area and relocated Navajo refugees from the Navajo/Hopi land dispute. That dispute relocated hundreds of Navajos to the Sanders area from the western Navajo Nation, mainly around the Hopi partitioned land. The area was mostly ranch land until the U.S. government bought it and added it to the Navajo Nation in 1981. Sanders is located at 35°12′59″N 109°20′01″W﻿ / ﻿35.21639°N 109.33361°W﻿ / 35.21639; -109.33361 (35.21649, -109.33366), at Exit 339 on Interstate 40. 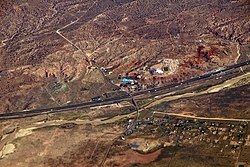 By I-40 it is 6 miles (10 km) west to Chambers, 53 miles (85 km) west to Holbrook, and 44 miles (71 km) east to Gallup, New Mexico. U.S. Route 191 leads south 54 miles (87 km) to St. Johns. According to the United States Census Bureau, the Sanders CDP has a total area of 2.4 square miles (6.2 km2), all of it land. Sanders is located on the south edge of the Defiance Plateau adjacent to the Puerco River with Puerco Ridge to the south. The vegetation of the surrounding region includes juniper, pinón pine and a variety of native plants such as prickly pear cactus and sagebrush. Wildlife includes pronghorn, deer, cougar, coyote, elk, turkey and quail. As of the census of 2010, there were 630 people, 200 households, and 151 families residing in the CDP. The population density was 262.5 people per square mile (101.6/km²). There were 242 housing units at an average density of 100.8/sq mi (39.0/km²). The racial makeup of the CDP was 71.4% Native American, 22.7% White, 0.2% Black or African American, 0.5% Asian, 0.2% Native Hawaiian or other Pacific Islander, 0.8% some other race, and 4.3% from two or more races. 3.8% of the population were Hispanic or Latino of any race. There were 200 households out of which 48.5% had children under the age of 18 living with them, 44.5% were headed by married couples living together, 25.0% had a female householder with no husband present, and 24.5% were non-families. 21.0% of all households were made up of individuals, and 4.5% were someone living alone who was 65 years of age or older. The average household size was 3.15, and the average family size was 3.71. In the CDP, the age distribution of the population was 37.1% under the age of 18, 9.7% from 18 to 24, 24.0% from 25 to 44, 21.3 from 45 to 64, and 7.8% who were 65 years of age or older. The median age was 26.8 years. For every 100 females, there were 84.8 males. For every 100 females age 18 and over, there were 80.0 males. For the period 2007-11, the estimated median annual income for a household in the CDP was $23,816, and the median income for a family was $24,375. The per capita income for the CDP was $6,741. About 36.6% of families and 33.1% of the population were below the poverty line. Education in the community is organized by Sanders Unified School District. Sanders Elementary School provides education from kindergarten to grade 5 with Sanders Middle School operating from grades 6 to 8. Valley High School provides high school education. The elementary and middle school are on federal land while the high school is on reservation land. Sanders is served by the Nahata Dziil Health Clinic which opened in 2015. It is part of The Tséhootsooí Medical Center. Sanders Clinic, which is part of the St. Michael's Clinic, also serves the area. Sanders is served by three regional stores: Family Dollar, Conoco Gas, and Burnhams, a local trading post. Sanders is an intersection for Interstate 40 which runs east to west and Highway 191 which runs from south to north. Public transportation is provided by the Navajo Transit System which runs a local weekday bus route from the Nahata Dziil Chapter House to Window Rock. ^ a b "Geographic Identifiers: 2010 Demographic Profile Data (G001): Sanders CDP, Arizona". U.S. Census Bureau, American Factfinder. Retrieved April 30, 2013. ^ Byrd H. Granger (1960). Arizona Place Names. University of Arizona Press. p. 22. Retrieved 9 December 2011. ^ a b c "Profile of General Population and Housing Characteristics: 2010 Demographic Profile Data (DP-1): Sanders CDP, Arizona". U.S. Census Bureau, American Factfinder. Retrieved April 30, 2013. ^ "Selected Economic Characteristics: 22007-2011 American Community Survey 5-Year Estimates (DP03): Sanders CDP, Arizona". U.S. Census Bureau, American Factfinder. Retrieved April 30, 2013.